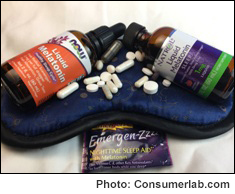 Make sure the melatonin supplement you take passed our quality review and is right for you! Melatonin can help you sleep and may have other benefits relating to pain and anxiety, but how much melatonin should be taken, when should it be taken, and which is the best melatonin supplement for you? In this report, ConsumerLab.com explains what melatonin is, when melatonin is most likely to help with sleep problems and how to use melatonin. Most importantly, this report shows you which melatonin supplements are high quality, provide the right dose and type for you, and offer the best value. Our tests found a wide variety of melatonin products to be of high quality -- containing the labeled amounts of melatonin and, if regular tablets or caplets, breaking apart properly in disintegration tests. However, we also found significant differences among melatonin supplements: Suggested daily dosages ranged 33-fold, from 0.3 mg to 10 mg, and cost ranged nearly 300-fold, from just 1 cent to almost $3 for an equivalent amount of melatonin. This means you may not be using the right dose if you go by the label, and you could be paying a lot more than you need to if you're not using our product comparisons.